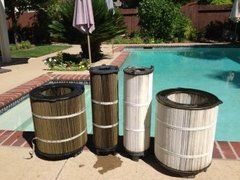 Filter Cleaning for Hayward Pentair and Jandy pool filters Sacramento Ca. Our pool filter inspection, diagnosis and cleaning package costs $75 per visit. System 3 and D.E. Filters will be $100 per visit. We Charge extra to recharge D.E systems.